Controversy erupts over a proposal for Alameda to create a sister-city relationship with a small Palestinian village. A group led by Pastor Michael Yoshii (rear center) asked the association to submit the sister-city proposal. 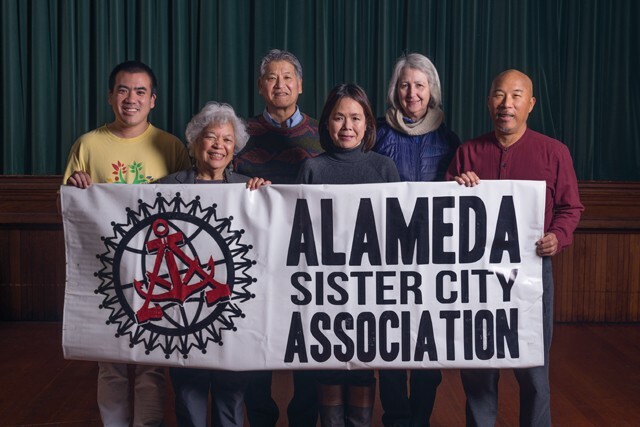 Like many cities nationwide, Alameda has created sister-city relationships with municipalities around the globe. These arrangements establish cultural and political exchanges between Alameda and other cities, in which Alameda's mayor and city leaders visit the sister cities to learn more about how they live and govern themselves, and vice versa. Alameda most recently created sister-city relationships with Dumaguete, Philippines, and Yeongdong-gun, South Korea, and the selection of sister cities is typically noncontroversial. But Alameda's current discussion over a new sister-city proposal has sparked a heated debate on the Island that rivals arguments over hot-button issues like housing and traffic. And it even involves the foreign consulate of a major nation. The controversy centers on a proposal for Alameda to create a sister-city relationship with the small Palestinian village of Wadi Foquin in the Israeli-occupied West Bank. The Alameda Sister Cities Association, which is the local chapter of an international organization, recommended that the Alameda City Council adopt a sister-city relationship with Wadi Foquin last year. The association maintains that the proposal was not intended to be political, but at a December council meeting, councilmembers decided to table the plan after it engendered a backlash. In his emailed letter to the city, Ravit Baer, deputy consul-general, called Wadi Foquin the "poster village of anti-Israeli propaganda" and questioned whether the Israeli-Palestinian conflict and its complexity is a matter for municipal governments to debate. "Further, since the proposal is promoted by self-declared BDS [a movement calling for the boycott, divestment, and sanctions against Israel] activists, we can assume that the sister city agreement will be used to promote BDS activity in the future, under municipal hospices. This might even be against California law." The original proponent of the sister-city relationship with Wadi Foquin was Pastor Michael Yoshii of Alameda's Buena Vista United Methodist Church. Over the years, Yoshii had become aware of the plight of Wadi Foquin residents, who have long dealt with the expansion of rapidly growing Israeli settlements. Palestinians and activists say that sewage and runoff from the Israeli settlements are ruining Wadi Foquin's farmlands and that barriers erected by the Israeli settlement of Beitar Illit have cut off its roughly 1,200 residents from nearby Bethlehem. Yoshii's church began a ministry to help the village called "Friends of Wadi Foquin." In an interview, Yoshii said the Wadi Foquin sister-city bid was "intentionally non-political" and had its origins in his relationship with Wadi Foquin Mayor Ahmad Sukor. "We told people up front this would be people-to-people, educational, and cultural," said Yoshii. He's also adamant that the Wadi Foquin resolution is not sponsored by his church (as wrongly asserted by City Attorney Janet Kern in December), but, instead, by the Alameda Sister Cities Association, which vetted the proposal and approved it in February 2017. In a statement issued on Jan. 6, the Friends of Wadi Foquin group also maintained that the Sister Cities organization is not political but added that the Israeli Consulate's letter to the city seeks to "shield the state of Israel from any critique of its human rights violations against Palestinians living under military occupation … As a city which claims to be inclusive for all, the city of Alameda needs to be aware of discriminatory attitudes being displayed towards Palestinians in general, and in this case, the specific village of Wadi Foquin." In 2016, the California Legislature overwhelmingly approved Assembly Bill 2844, which prohibits the state from doing business with organizations that boycott Israel. A number of Bay Area progressives, however, did not register a vote on the bill, including Bonta and state Sen. Nancy Skinner, D-Berkeley. The bill was heavily backed by many U.S. Jewish groups, but critics said the legislation, later signed into law by Gov. Jerry Brown, was intended to be a bulwark against a growing movement to boycott, divest, and sanction Israel for its mistreatment of Palestinians. Some supporters of Israel allege that the BDS movement is anti-Semitic, a charge echoed by Baer. "This is something that is probably the most disturbing to us," he wrote, "and we worry when municipal bodies are used in that manner." But Yoshii argued that the deputy consul-general's letter unfairly blurred his role as pastor of the church and his involvement in the sister-city movement. (In addition to being pastor of the Buena Vista United Methodist Church, Yoshii is chair of the sister city committee for Wadi Foquin and co-chair of Friends of Wadi Foquin.) "Obviously, the consulate general is targeting me because I've been involved with BDS, making an indirect charge and conflating BDS with this situation. This has nothing to do with BDS. It's about human rights. Furthermore, there's no contract involved in this proposal," said Yoshii. Without a doubt, the spotlight on Yoshii's past activism upset him and his followers who huddled outside Alameda City Hall for nearly an hour after the city council on Dec. 5 decided to table the sister-city item. "We make no apologies for our political advocacy," said Yoshii. He says every municipality that has attempted to create a sister-city relationship with a Palestinian city or settlement has received pushback. "So, you know it's coming from a higher place. To me, it's discrimination." But several members of Alameda's Temple Israel, which suffered a number of hate crimes last year, oppose the current sister-city plan with Wadi Foquin. In a statement to the magazine, co-chairs of the Temple Israel steering committee Rabbi Steven Chester and Raviv Moore said the synagogue supports Alameda's sister cities program in general. "Unfortunately, the current proposal is connected with a political agenda, the Boycott, Divestment, Sanctions (BDS) movement, that is more about dividing than uniting cultures. This connection is especially concerning given the experiences the city has had with anti-Semitic activity, including the vandalism of our synagogue." They proposed a compromise: seek simultaneous sister-city agreements with both Israeli and Palestinian communities. "This will demonstrate that Alameda is truly inclusive and make a strong statement for peace," they wrote. City Attorney Kern is expected to present a report on the Wadi Foquin proposal to the council this month. This report was originally published by our sister publication, Alameda Magazine.